Prepare A: Slice tofu into 1cm like string and drain liquid by paper towel. Simmer tofu with "TERIYAKI SAUCE" in a pot for 15 minutes by low heat. Prepare B: Slice onion thin, cut string konnyaku into Bite-sized pieces. Boil them (onion and string konnyaku), and drain the water. Fry onion and string konnyaku with olive oil until evenly heated through, add "TERIYAKI SAUCE". After it is mixed well, place it in the refrigirator to keep it cold. Prepare Sushi: Sprinkle some salt and pepper on the beef and place it in the refrigerator to keep it chilled. Put plastic wrap on a bamboo rolling mat and spread sushi rice on it. Add A, B and lettuce at the center of the sushi rice and roll them slowly. Take away the plastic wrap and place the beef on an additional bamboo rolling mat. 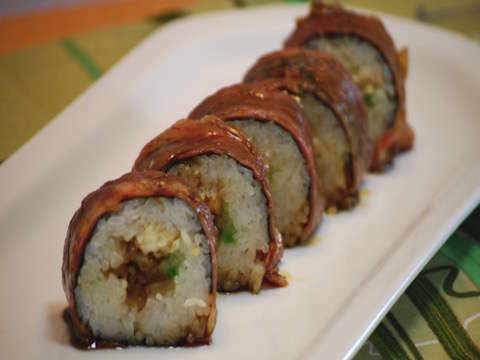 Place the rolled rice on the beef. Roll them slowly and fry the roll sushi with oil. Add "TERIYAKI SAUCE" and sugar to the pan. Cut the roll sushi and dish it up.